Carproof Corp. was launched in 2000 by Paul Antony of London, Ont. 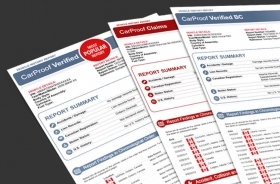 Vehicle history provider Carproof is changing its name to Carfax Canada to more closely align with its corporate sibling. Carproof Corp. was launched in 2000 by Paul Antony of London, Ont., and acquired for C$650 million in 2015 by IHS Markit, parent company of Virginia-based Carfax. While the switch aims to build on the globally known Carfax brand, Shawn Vording, Carproof's vice-president of automotive sales, said products from the leading Canadian auto data service will not change. "Our partners will still receive the comprehensive history and valuation information they have come to expect," Vording said in a release. The name change takes effect in October.